Tiffany shared this recipe with me on her recent visit to Boston, as shared from her mother-in-law. I'm excited to try it out as soon as we return from South Africa. The main bread I'm eating now is the basic bread from the Tassajara Bread Book . I like it because not just because it's easy and it makes wonderful bread, but also because 1) you can use sweet potatoes in it, which have good vitamins and things and are really tasty, and 2) it has some eggs and butter, which means that it boosts the nutritional content of the bread (ala Michael Pollan's philosophy that "low-fat" isn't necessarily always good and that some fat with one's carbohydrates enables the body to process the food slower, making high-glycemic index foods less "unhealthy" for one). 2. Crumble into mixture 1 packet/1 tbsp yeast. Stir until dissolved. 3. Add 2 eggs and 2/3 cups softened butter. 4. Mix in first with spoon, then with hand, 1 cup mashed potatoes (also lukewarm, not cold) and 7 to 7 1/2 cups flour. 5. Knead until smooth. Place in an air-tight container in the fridge or a bowl covered in moist cloth. Keep for as long as 7-10 days. Maybe even longer! As long as it doesn't smell "off", I think it's fine. 1. Cut off as much dough as you need and shape into desired shape (loaf, cloverleaf rolls, crescent rolls, knots, regular rolls, etc.) in/on the thing you're going to bake it in/on (a greased loaf pan, cast-iron skillet, cake pan, muffin tins,cookie sheet. Don't forget to grease) . Cover with damp cloth. Be Creative! This dough recipe works for EVERYTHING. 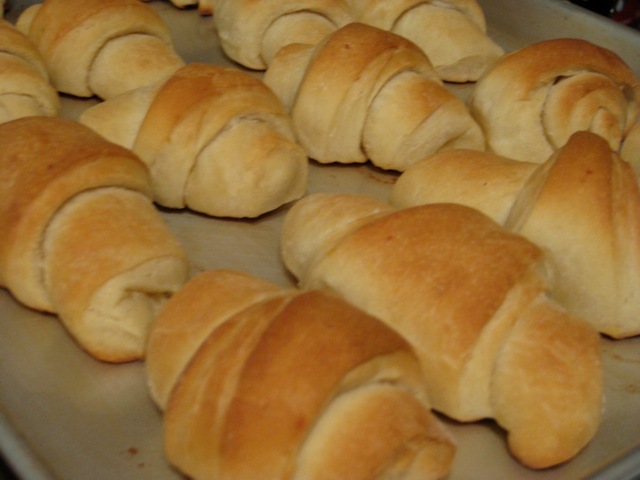 I usually make rolls and add extra butter (brushing it on the top, or on the dough-surface before rolling it up). But I've also made cinnamon rolls (add cinnamon-sugar and butter before rolling up), basil rolls, cheese rolls, and marinara sauce rolls. You can add cheese or ham, or garlic, or thyme, or olives, etc. Do you have a bread recipe that you really love? How do you fit bread-baking into your busy lives? How did you decide to start baking your own bread? I'll start: My experience with bread in the U.S. was that at first, I was confused as to what bread I should buy: bakery bread was very expensive, and the packaged bread just seemed.... strange, for lack of a better word. But I thought it was very difficult to bake bread. So at first, I didn't eat much bread (as compared to in South Africa, where at least one meal of the day was always bread.) Then we got a breadmaker for Christmas, and change has been very gradual. Baking bread using the breadmaker was so easy that we didn't buy bread at all. I highly recommend it as a gateway. Just in the past couple of months, I discovered that baking bread from scratch is not as hard as I thought. It helps that I get home around 2:30pm, so there's enough time (Noah permitting) to bake 2 loaves. Our move has accelerated the transition (we're not keeping the breadmaker), but it was a transition I was ready for. Aside: If anyone is willing to share guest posts over the next two weeks while I'm in South Africa, I'd be REALLY grateful. I'd love to hear your stories, and I'd love to keep the blog alive even when I'm only able to check in occasionally. oh this reciepe sounds like fun! and good for rolls especially as i like to make those but it usually takes longer to do in a busy day I might not get to it. I started making bread when I realized that I really enjoyed homemade bread, that store bought bread had a suspicious amounto f ingrediants, and when i got the book Ratios, which had easy to follow directions in it and made it sound simple to make. also i can get flour for cheap so it is a good grocery budget saver to make bread! we eat ALOT of bread here with 3 eating kiddos and 2 carbo-addict parents, so it was worth it to learn how to make it from scratch! Yes-- that long list of ingredients! Thanks to your amazing bulk flour, the cost of bread for us has gone from about $1.42 to about$.50. Which is just amazing, as suddenly great quality bread is super affordable.